Michigan is the Great Lakes State, with shoreline on four of the five Great Lakes and a total of 3,288 miles of coast. Yet, too many Michigan residents have little or no contact or understanding of the Great Lakes and their own personal roles as stewards of these incredible natural resources. There is no requirement in Michigan schools to teach about our Great Lakes, which has contributed to a low level of Great Lakes literacy and stewardship. Educational access to the lakes is restricted by the cost of out-of-classroom experiential learning opportunities. There is a tremendous need for Michigan residents to better understand the Great Lakes, the nature of the challenges facing them, and the roles they can personally play in addressing problems at the household, school and community levels. 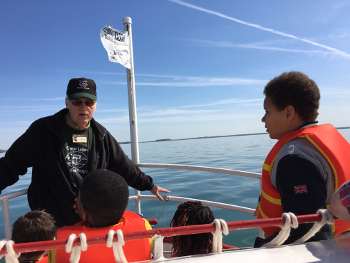 The Great Lakes Education Program has been providing students, their teachers and their families in southeast Michigan with an opportunity to learn about and become active stewards of our Great Lakes since 1991. Give to the Great Lakes Education Program (GLEP) and help students learn about our Great Lakes by being on the lakes. Full funding will support the participation of 20 classes (grades 4-12) in the 2019 Great Lakes Education Program. GLEP provides award-winning, research-based education in southeast Michigan using a three-phase preparation/action/reflection approach. Classroom lessons are combined with vessel-based learning to provide a unique and effective learning experience. GLEP outcomes, documented through university research, show significant gains in participant knowledge, behavioral intentions, and stewardship actions. Support an entire class for $667, or an individual student for only $22. Thank you! The Great Lakes Education Program is a collaborative effort led by MSU Extension, Michigan Sea Grant, and the Huron-Clinton Metroparks. Steve Stewart, Senior Extension Educator and co-founder of the Great Lakes Education Program, coordinates the regional GLEP effort and administers GLEP education in Wayne County. Gary Williams, Extension Educator, administers GLEP education in Wayne County. Justin Selden, Extension Educator, administers GLEP education in Macomb County. *Make check payable to Michigan State University and write “Appeal 19OOPCF1GLEPGGD” in the note section.